Over the course of the last 24 hours, further heavy rain has impacted the Paluma region whilst the indication of increased rainfall over the Whitsunday and Central Coast region has finally (from a forecast accuracy perspective) come to fruition. Rainfall across the Townsville region thankfully has eased off and should continue to do so unless some isolated in nature throws a curveball. As records keep rolling, Paluma has continued on with its insane run of accumulative totals. Paluma recorded 165mm in the 24hrs to 9am Thursday, this makes it the 11th consecutive day above 100mm for the station as well as now accumulating a grand total of 2571mm for this event! The past 24 hours has also ended the 100mm streaks of both Upper Bluewater (22mm) and Rollingstone (19mm). This leaves Paluma on its own with this streak now. Woolshed is also just 12mm shy of the 2000mm mark as well, with Upper Bluewater, Paluma and Paluma alert stations already above this feat. • Adelaide has recorded the same amount of rainfall between April 9th 2014 and February 7th 2019 (1766 days). 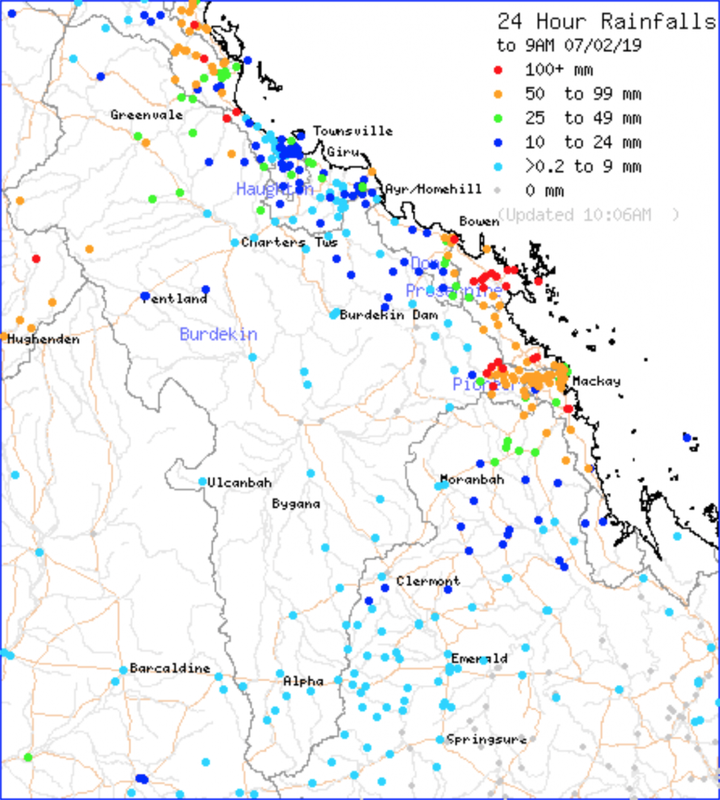 • Darwin has recorded the same amount of rainfall between November 15th 2017 and February 7th 2019 (450 days). • In a normal year, Birdsville averages around 168.7mm – this would be the equivalent of Birdsville recording more than 15 consecutive “average” years (roughly 5570 days as its a little over 15 years).